Managed to find this guy hiding in a creek. Slurped up a Zman curly tail and fought like I'd cursed his momma. To make it up to him, I brought him home to dinner to meet the family. Made my day. Folks up here think that trout are the bomb-diggity. 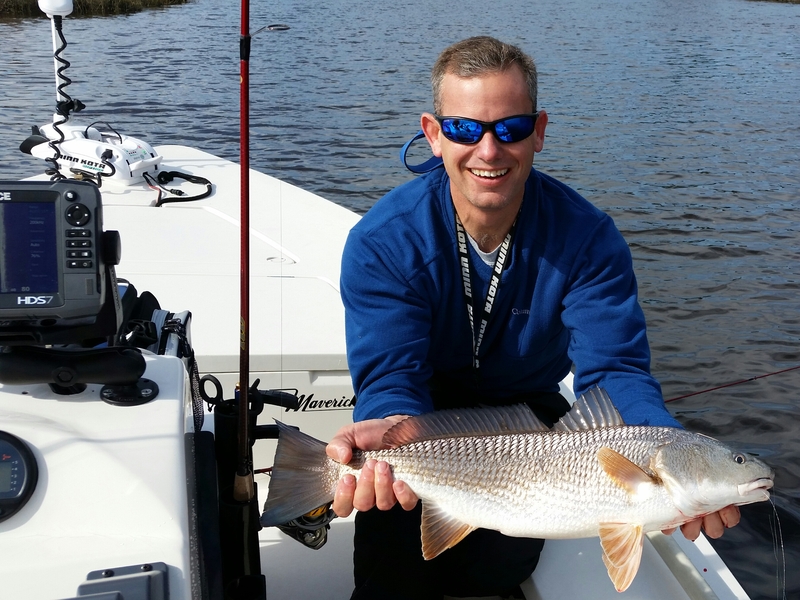 Personally, I'll take a redfish or a striper over a trout any day of the week! Nice fat red there ! Good catch....the water temp here is around 53 in the creeks....we should start seeing some nice reds also. The trout get lethargic in the mid 50's....we are going this weekend and give it a try. It has to be a real crappy, cold and overcast day here for the Stripers....but, we normally have a few good Striper catches each year. Man, it is so funny how that works. I lived in FL for 15 years and down there, trout is what you catch when you are being lazy. They are just plentiful - find a grass flat with 4-6 feet of water over it and drop a gulp shrimp down and you will pull up a trout. When you want to really "fish" you chase reds, Snook, Tarpon, etc. When I moved to NC and people started talking about trout like they were something special, I thought they were kidding. Having been here a couple of years now, I can feel it growing on me. They are MUCH tougher to find here, much harder to catch, and they tend to be bigger and meaner. Here in South Georgia....trout are twice as hard to catch as reds or flounder. They are spooky to movement, finicky with diff water temps, they do not hang out in dirty water...just overall a much tougher fish to target. I primarily use artificial baits and only use live bait for tripletail and tarpon. I have fished many trips to Steinhatchee and Marco Island and I agree, you find a spartina grass flat and 4 to 6 ft of water and it's game on with the trout. The reds were always around shells and the snook are like ghost. I did figure out that the snook liked the mangrove trees in the water and fast moving water on a curve in the creek.